This June, Danny and I are hosting a highly anticipated Wimbush family reunion. Two parents, three siblings, three siblings-in-laws, and three nieces and two nephews will join our family of four. Count it up, folks, that's seventeen mouths to feed, and I couldn't be happier about the fact. Yup, I'm pretty tickled about it all. We haven't all been together since summer of '07 ( I know) where we threw this little country party under the watchful eyes of the mountains. Three years (and three more grandchildren later) is just too long to be apart. Obviously, we have much to celebrate. Since the countdown is actually weeks and not months now, I sat down today to start a to-do list. Yes, I like to feed people. A lot. And I like to be organized. That means stocking the freezer and pantry, jotting down a loose menu plan, and reserving another side of beef. Here's what will be joining the beef in the freezer, I mean, ideally -- if I only sleep four hours every night between now and then. 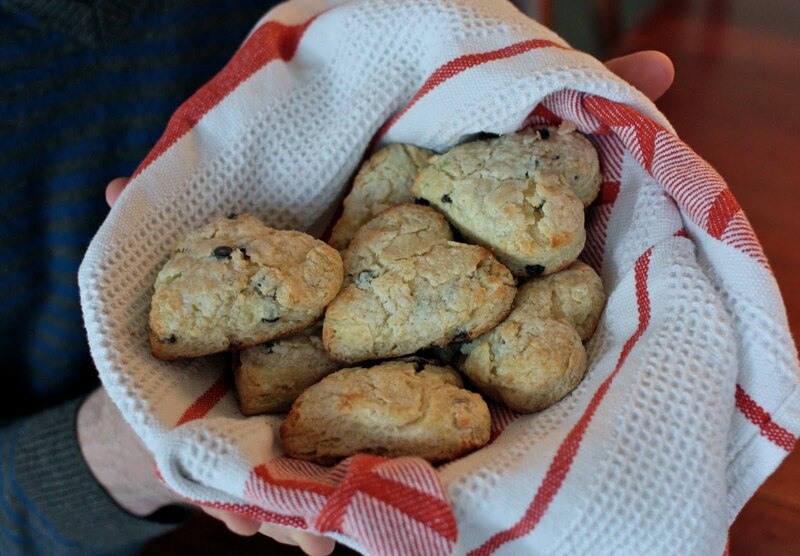 Several dozen of these Lemon-Ginger Cream Scones, raw. Cubed fruit for smoothies, bananas, berries, etc. Buckwheat pancake mix. Still have to come-up with a good recipe. This Granola. Like about a gallon of it. Pre-cooked bacon. I bake it on a foil-covered baking sheet, where it cooks nice and flat. I might even glaze it with maple. Then I toss it in Ziplock and freeze for easy, no mess, bacon & eggs. Julie's Puddle Cookies. We're addicted. This Dark Chocolate Caramel Sauce. Technically, it will go in the fridge, not freezer. Pie crust, for this Stone Fruit Patchwork Bake or quiches. Also puff pastry, but not homemade. Oat topping for fruit crisps/crumbles. My Tonka Bean Spice Snaps. They freeze wonderfully. Marshmallows. Of course. We have a fire pit in the back yard and have discovered that these Toasted-Coconut Marshmallows are pretty heavenly when roasted on a stick. Beef bone stock and demi glaze, a lovely reduction of beef stock and red wine used for flavoring sauces. Lobster butter, for this killer salad. Perhaps. I'm getting excited just planning this part and this is just the beginning! As the date draws closer, there are cheeses to select, a wine rack to fill, and markets to scour for the very best Quebec produce. There's only one rule when my family visits: NO diets. OK, what am I missing?? What would you make ahead of time and throw in the freezer to simplify meals, while trying to keep it as yummy as possible? Please add your suggestions in the comments! Bear in mind we will be eating most lunches on the go (beach, mountain, zoo, downtown, winery, etc) and most dinners will be prepared fresh. Wo-hoo! Five weeks to go 'til the first airport pick-up. Wow! Looks like it will be a blast. Isn't funny how some take on the task of hosting an event and are so apprehensive about it-and then you have foodies who embrace it! A woman after my own heart, thinking ahead and doing way too much! I know everyone will thoroughly enjoy and appreciate your efforts but you'll need a vacation after all of that! So to complicate your already complicated world, how about a ready-made lasagna with hidden veggies, premade hamburger/turkey patties, chicken and/or pork tenderloin in ziplock baggies with the marinade already on them? Just a few ideas of things I like to find in my freezer! Are you in charge of ALL the food? Or will people help out with ingredients, cash, cooking, etc? That's a pretty big burden/fun opportunity (depending on the moment) you'll be carrying. My list would be similar to yours, though I would also have sourdough bread on there, as well as French chocolate granola. Maybe caramel popcorn all ready made to pull out come evening. A couple liters of homemade yogurt on hand. Ready-made potato salad, Greek pasta salad, tuna and egg salads. Frozen sweet rolls. I pull a lot of my food from the basement: jars of grape juice concentrate, pesto, salsa, applesauce. Pesto torte is a biggy. Cookie dough in the freezer for fresh-from-the-oven cookies. Ice cream mix made up ahead of time. I'm getting hungry! It's the cleaning that wears me down---I find the cooking to be inspiring. Sounds like the start for a wonderful party!! This is looking good already, very impressive planning. I think it's kind of an English thing but a crumble is a super easy dessert that travels well. I'm not a great dessert maker or eater but this is pretty fail safe. You basically stew any fruit you like, rhubarb is a classic - I use cinnamon a little ginger & honey. When nicely reduced - add the crumble topping, bake et voila ! I'm sure there is a more comprehensive recipe ! We serve it with custard or ice cream. Home made pesto in the fridge is always good for easy pasta dishes. Yum ! Enjoy ! I feel lost without tortillas in the fridge. Breakfast burritos, quick tacos, make-ahead enchiladas, toasted to go with dips/hummus. And lots of cheese. What meal cannot be made better if St-Andre or stilton is pulled out (toast and cheese, pasta sauce, wings, pre-dinner munchies, evening snacks).